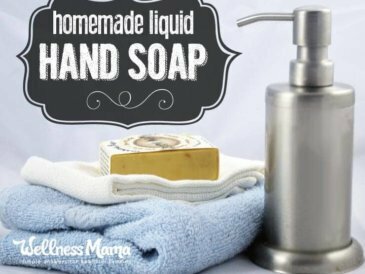 I’ve managed to tackle homemade laundry detergent, but homemade liquid dish soap for handwashing dishes has been on my DIY list for a long time. 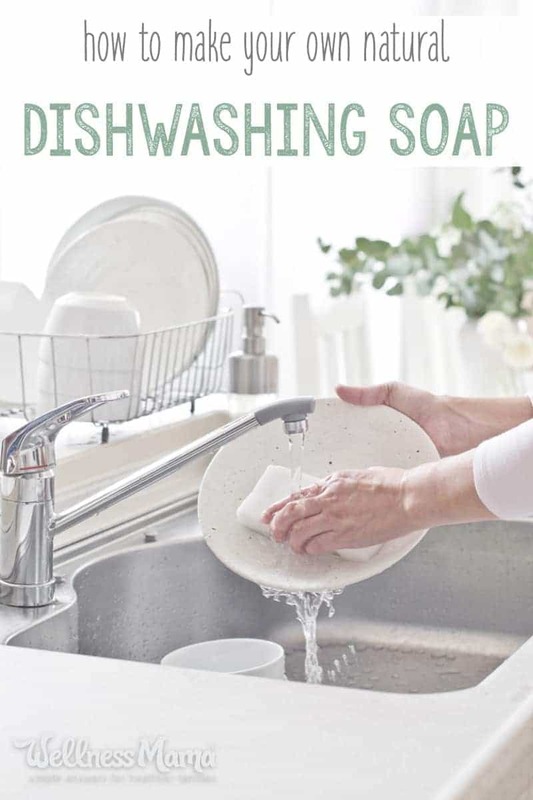 Making a natural dishwashing soap that works and is the right consistency can be tricky. Fortunately this version is natural, easy, and it really works! 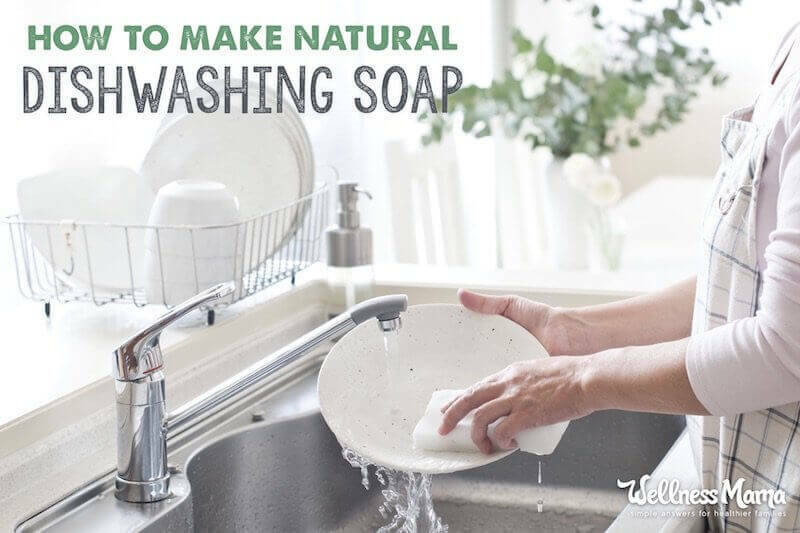 It’s not difficult to pick up a natural dishwashing soap at your local supermarket, or even on Amazon. However, even some of the so-called natural ones have a laundry list of ingredients that I’m not so thrilled about. Plus, many of them don’t work nearly as well as advertised. And of course, there’s always the issue of cost. With a fairly large family to clean up after, dish soap doesn’t last for too long around here (especially when the kids are “helping” with the dishes). I love my homemade cleaners, but they’re not without their downsides. I chronicle my ups and downs with DIY green cleaners over the years in this post. Many recipes call for vinegar (powerful, but I can’t stand the smell) or Borax, which is controversial. I also just don’t have the time I used to (because kids, work, and life!). 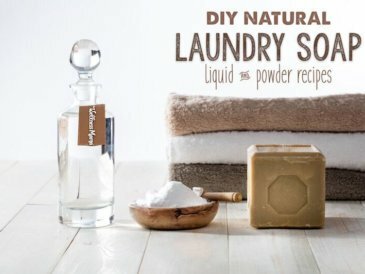 I still make natural cleaners when I can, but have found a few store-bought options like the Sal Suds featured in this recipe. Still, I wanted to try my hand at making liquid dish soap for the reasons listed above, but most recipes I had tried in the past (not all though) fell flat. 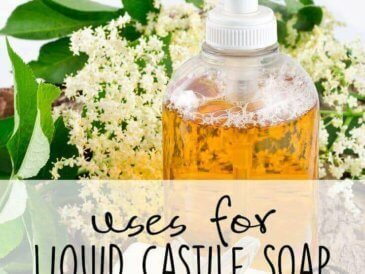 A lot of DIY recipes call for castile soap, which is great for so many things, but doesn’t have quite the same “oomph” as store-bought dish soap. For those who have hard water, castile soap can sometimes leave a film on glassware. To get extra degreasing power, many recipes combine vinegar with the castile soap, but that doesn’t work so well either. The vinegar unsaponifies the soap, which is a fancy way of saying that the soap is no longer soap and doesn’t clean. Not something I want to use to wash dishes! 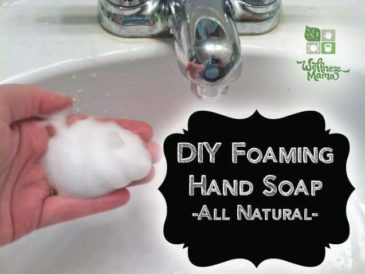 This dish soap recipe relies on Sal Suds instead. It’s a concentrated natural cleaner that’s produced by the Bronner family, the same company I buy my Bronner’s castile soap from. 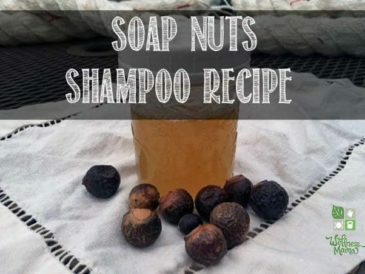 Both cleansers are equally safe and effective, but for the purpose of this recipe, the Sal Suds seems to work better. I’ve used citrus oils here for their fresh, clean scent and antimicrobial properties. Lemon essential oil is a potent antibacterial and helps cut through grease. Grapefruit is also an antibacterial and antifungal disinfectant, and lifts the mood. It’s possible to add almost any essential oil to this recipe, including lavender, sweet orange, peppermint, and eucalyptus. 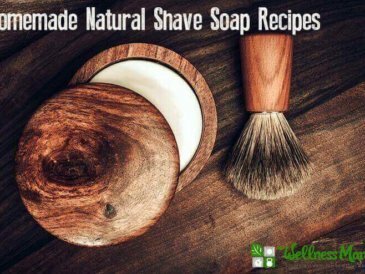 The Sal Suds cleaner in the recipe already has fir and spruce essential oil, so it’s best to pick an essential oil that will blend well with the pine scent. The additional essential oil can also be omitted if desired. There are a lot of homemade liquid dish soap recipes you can find online, but I’ve found this one to work better than all the others. In a small pot heat the water and salt, stirring frequently until everything is completely dissolved. Remove the pot from the heat and pour the contents into a small bowl. Set the salt mixture aside. I used kosher salt and it wouldn’t completely dissolve, so I just strained the residual salt pieces out. Add the washing soda and 1 and 1/3 distilled water to the pot and heat just until dissolved. Add the Sal Suds, washing soda and water, and essential oils to a dish soap dispenser. If your container has a small opening, then it works best to mix this in a glass mason jar. Add 1 tablespoons of the salt water to the soap and stir. It will turn cloudy and thicken. Add another tablespoon of salt water mixture if you want it thicker. Keep in mind that it may thicken more over time. Pour the mixture into a soap dispenser. Note: Over time this liquid dish soap may thicken a little too much. If this happens, add a little more water until it is the desired consistency again. Ever tried making your own liquid dish soap? How’d it turn out? Share your experiences below!